You’ve decided to bring your children home and teach them yourself. You have prayed, read all the experts, purchased your curriculum and began your homeschooling experience. But everyday isn’t perfect, some days you find yourself questioning your decision, your ability, even the reasons you began home schooling in the first place. Now what do you do? This is the moment Encouragement Along The Way was written for. Bobbie not only shares the good times, but the hard times, the insecure times and the rare moments when her Heavenly Father pulls her close and touches her heart; breathing new life into her homeschooling experience. 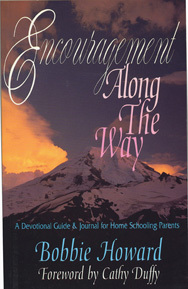 If you question, wonder and love home schooling, this book is for you.